The original lighthouse on this site was first lit on October 28, 1850. The lighthouse replaced a lightship that had marked the shoal since 1823. The 1850 lighthouse the first screw pile lighthouse to be constructed in the United States. In 1914 it was replaced by the current caisson type lighthouse. 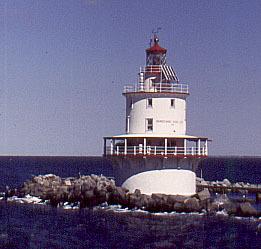 The light was automated in 1974. Within the last couple of years it has been converted to solar power. Early government records refer to this lightship as Floating Light #1 or Lightboat #1. It was stationed on Brandywine Shoal from 1823-1850, and was replaced by the Brandywine Shoal Lighthouse. The vessel was anchored about 1 mile west of the Brandywine Shoal and marked the eastern edge of the channel. Lightship "N" was the only vessel to be stationed there. She was built in 1823 in New York, probably by Henry Eckford, and was 72' long with a 20' beam and of about 120 gross tons. She had two masts, and displayed at fixed white light on the foremast at 42' and on the mainmast at 45'. She had a hand operated bell. No drawings of her have yet been found. Fifteen years old; very much out of order, requires thorough repairs. The cause of rot in our light vessels can be attributed to the following causes: want of care and proper ventilation, and the mephitic vapor arising from bilge water. All the caused can be obviated by the use of the common wind sail (or tin or copper ventilators) and the inverted bellows, as used on board the vessels of the Navy, which has proved of decided benefit in expelling the noxious vapors arising in a ship's hold." After her service at Brandywine Shoal, the vessel was transferred to Minots Ledge in Massachusetts for four years. Her next station was at Cross Rip, Massachusetts, after which she served a short stint on Five Fathom Bank (1855). She was retired in 1859.